Piebald dachshunds are distinct from dappled dachshunds. Dachshunds are fun, loving dogs and can be a popular choice for apartment living. With any short, long or wiry hair, a dachshund can be black and tan, red or spotted. A piebald dachshund has a white coat with patches of gray, black or brown. A piebald dachshund puppy is born when two wieners with the recessive piebald gene breed together. 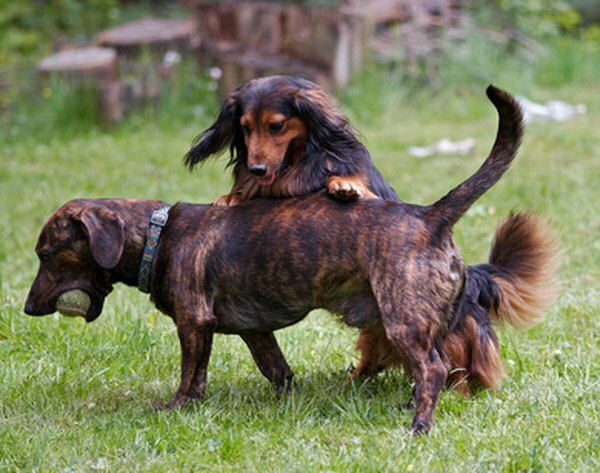 Dachshund coat colors and patterns are determined by so-called dominant and recessive genes in the dog's parents. Notably, this does not mean that the parents both have to be piebald dachshunds. A dappled or solid-color dog can carry the recessive piebald gene. Your sausage dog is a piebald dachshund if it sports areas of full-color fur on a white background. You have probably seen the piebald pattern on other dogs that, like the dachshund, are part of the hound family. Basset hounds, beagles and greyhounds quite commonly display a piebald pattern. 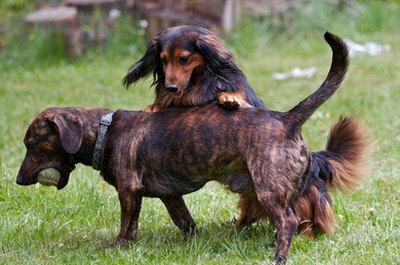 Dapple-pattern dachshunds are commonly confused with piebalds, but these are different types of coat pattern. The dappled dog has patches of one color over a solid base, with the base color showing through the dapple. Some piebald lovers are outraged that the Dachshund Club of America and the American Kennel Club's classify piebald as "non-standard" for dachshunds. "Save the Piebalds" petitions argue for a change in the breed standard. Although piebald dachshunds are not barred from competition, the breed standard emphasizes other colors and patterns as preferable for this breed. If you are keeping a pedigree dachshund as a pet, you might find a great dog a little cheaper than a comparable pedigreed dog in a color that's preferred in competition. Generally, the health of piebald dachshunds is similar to that of other sausage dogs. The dachshund's long back predisposes the breed to neck and spine issues -- keep your dog at a healthy weight to avoid placing undue strain on the back. Provide regular exercise and discourage your dog from jumping on and off high surfaces such as couches or steps. Dachshunds have a reputation for separation anxiety, but with consistent care and training your piebald sausage dog will be a loyal and loving pet.